Jutting out into the Sea of Japan, the remote Noto Peninsula offers a coastline of impressive seascapes to explore by bike. While the rugged western coast rises and falls, eroded as it is by wind and wave, the eastern coast enjoys a calmer shore and stunning views of the distant Nagano alpine peaks. A protected national park, Noto Peninsula is awash with meandering hills. Perfect for those seeking an active adventure tour. Experience the magnificent sights of the bay with rocky outcrops such as the Ganmon Cave, a natural arch carved into the cliff by the tides. In Senmaida, freewheel down the hillside next to the country’s terraced rice fields as they stagger downwards to the coast. Inhale the bracing sea air at Noto Kongo, as you enjoy the peninsula’s most scenic spot. It’s not all pedal-heavy though, unwind in the mineral hot springs to soothe sore cycling muscles. Spend the night in a thatched-roof Gassho Zukuri; historical farmhouses that have survived for over 200 years, and sample traditional mountain dishes. As we head inland, wander the narrow lanes of Takayama’s old city between wooden sake breweries and charming boutiques. 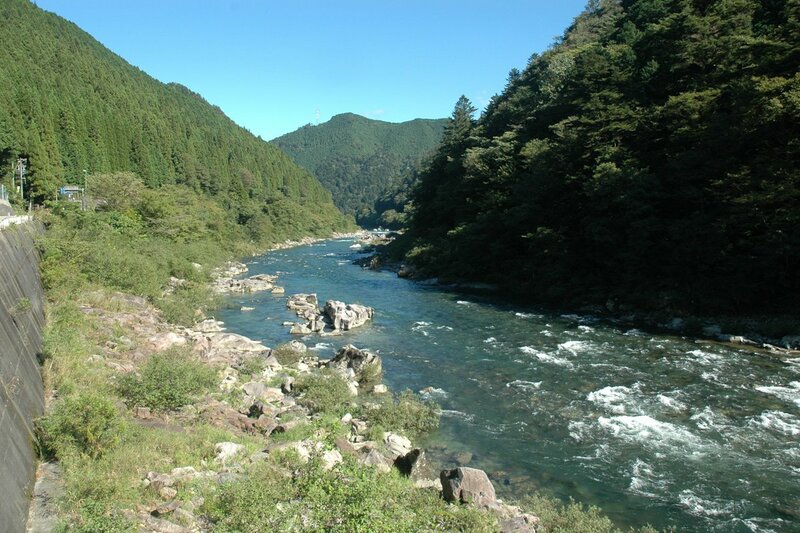 And bike the cherry-blossom paths along the Oyabe River, all for a Japanese experience you won’t forget. We meet in Kanazawa for trip briefing and welcome dinner. The journey begins with a warm-up ride along the coast, stopping at 2,000-year-old Keta Taisha Shrine and Ganmon Caves en route to Togi. Ride the Sekinohana coast to historic port city of Wajima and admire the stunning rock formations. Stay at traditional Minshuku where a hot spring awaits. Approach the tip of Noto and see the terraced rice fields of Senmaida and Old Tokukuni House, a former feudal lord's house. Our hotel has magnificent views of the bay. Spend the day exploring Notojima Island, against the backdrop of the snow-covered Japanese Alps. Relax in the baths at Wakura. A day of scenic coastal rides turns inland to explore the well-preserved area with traditional structures dating back to the Meiji Era. Into the mountains to the famous UNESCO World Heritage Site, Shirakawa-go. The last day of riding eases by an impressive dam on the way to wooden style sake breweries and quaint boutiques that line Takayama’s old city. Onward travels to your next adventure. You can take the morning train to Nagoya and transfer to bullet train for Kyoto or Tokyo. 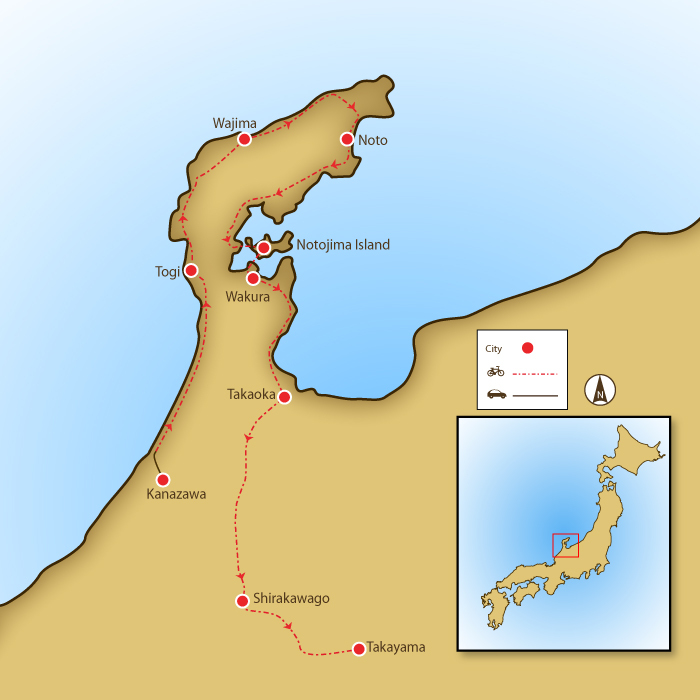 Day 2 - Kanazawa – Togi Ride 68km. +441m / -479m. We just arrived home yesterday after our week with Vincent and Yuko in Japan. The trip was fantastic and I want to thank both of you for a wonderful experience. Vincent was extremely professional and knowledgeable both in his cycling expertise and local knowledge of all of the hideaways and paths we never could have found without him. Despite some bumps and bruises we managed to have a truly spectacular time. A wonderful way to experience Japan. Beautiful trails, breathtaking views, and extremely qualified guide. I just wanted to let you know that we absolutely loved the trip. The guide Paul was extremely helpful, professional and organized. He had an assistant called Kenta and both made sure our experience was very local, enjoying the main sightseeing attractions, local food and a perfect combination between small hotels and local Japanese accommodations. The ride itself was beautiful, fun and an adventure. It was a great pleasure, thank for your help. The cycling around Noto Peninsula is moderately challenging with a few climbs. We ride 512 km on quiet roads with amazing views. The first few days riding are undulating, giving you ample time to warm up for the inclines towards the end of the trip, but averagely fit cyclists will have no problems. Suitability: This trip is suitable for anyone with a reasonable level of fitness. This trip is not too arduous, so riders with less experience are more than welcome, although the fitter you are, the more you will enjoy it. Biking Conditions: This trip is along tarmac roads in good condition, and there is no technical riding. The trip is fully supported; an air-conditioned bus follows us for the entire journey, so exhausted riders can skip the tougher sections if they wish. Upon arrival, the group meets at Dormy Inn, a two-minute walk from Kanazawa Station. If you arrive much earlier before the check-in time, you can leave your luggage at the hotel and familiarise yourself with this fantastic city. Visit Kenroku Gardens, former samurai houses, and Machiya, traditional Japanese townhouses dating back to the Heian Period (8th-12th centuries) before returning to check in and enjoy a welcome dinner and trip briefing. After a short transfer to the coast, we start cycling on a flat bike path and do a stretch along the beach as well. We have a short stop at the 2,000-year-old Keta Taisha Shrine and also check out Ganmon Cave, a natural arch in the sea. The last 20 kilometres of the ride will be undulating as we enter the Noto Peninsula. We finish and spend the night in Togi Town, where a hot spring awaits us at the hotel. We ride along the Sekinohana coast to Minazuki and have a filling lunch of soba noodles. As we head along the ocean towards the fishing port of Wajima, we’ll take the time to cool off and take in the rugged coastline and strange but beautiful formations shaped by wind and waves. Tonight, we stay at a traditional Japanese Minshuku, where we sleep on futons and can bathe in a hot spring. We’ll enjoy some excellent local seafood at our lodging, where dinner is a communal affair and guests are expected to be on time. Before leaving Wajima town, we wander through the Asa-Ichi morning market, famous for lacquerware and fish, before we start the longest cycling day of the trip. Today, we ride around the tip of Noto and see the terraced rice fields of Senmaida and for those interested, make a quick stop at Old Tokukuni House, a former feudal lord’s house. We pass Mitsuke Island before riding into Tsukumo Bay. Here we stay the night at a fantastic Japanese ryokan (inn) with hot springs inside caves and magnificent views of the bay. An easy coastal ride before we cross to Notojima Island, where we spend the day riding around the island with the snow-covered peaks of the Japanese Alps in the background. Upon arrival at Wakura, one of Japan's famous onsen towns, we check into the wonderful Umi to Niji Inn with plenty of time to relax in the baths that Wakura is famous for. From Wakura, we ride along more beautiful coast before turning inland and entering Takaoka through Kanayamachi. It is a well-preserved area with traditional warehouses and houses from the Meiji Era and known for its copperware manufacturing roots. Once we check into our hotel, it's worth going for a short walk to visit the National Treasure, Zuiryū-ji Temple, and Takaoka’s Great Buddha. We follow a bike path along the Oyabe River to the base of the mountains and stop to check out Zuisen-ji Temple, one of the largest wooden structures left standing in Japan. Next, we head into the mountains for a few good climbs. After arriving, we can spend the afternoon exploring Shirakawago, a UNESCO World Heritage Site famous for its gassho zukuris, nail-free "clasped hands" thatched roof houses. We spend the night at a 200-year-old gassho zukuri and eat traditional mountain food, again with other guests at one sitting. An after-dinner dip at the local onsen is recommended. It will be an early start for the last day of riding. The route today takes us beside an impressive dam before a nicely graded road takes us over two pleasant passes. We spend the afternoon looking around Takayama’s old city, where narrow lanes are lined with wooden buildings housing sake breweries and quaint boutiques. This morning we’ll assist you with planning for your onward travels. You can jump on a morning train to Nagoya and then transfer to a bullet train for Kyoto or Tokyo. Because some people can't imagine going on a trip without their own beloved bicycle, we do not provide them as part of this tour. However, you can hire bikes locally for the price listed in the tour pricing section. The bikes are well-known makes of hybrid bikes with lightweight alloy frames, 24- to 27-speed gearing, v-brakes and Shimano components and front suspension. If you bring your own bike, please make sure it is a mountain bike, preferably with front suspension, in good mechanical order.